Goose hunting requires careful hiding places. Modern farming methods and crops often require hunters to hide their layout blinds in flat fields with very little or no cover. This can be tricky to say the least. It’s very intimidating if you have never done it before. The worst place to hide is one of the best places to hunt. Short grass fields in the Pacific Northwest hold big flocks of geese and almost no cover. Modern layout blinds such as Finishers and Xlanders have taken the place of pit blinds dug into permanent locations. Layout blinds cut the profile of above ground blinds from 5 ft down to about one and a half. This makes hiding in the wide open much easier. In fact, in some conditions such as corn stubble it’s all you need. Simply stick some corn or grain stubble in your camouflage loops and hide the blind in some 6” stalks, and you’re hunting. Flat grass fields such as pastures and grass seed fields are much tougher. Next to two inch tall grass, layout blinds look exactly like what they are, goose death traps. From a goose view, the blinds are human size variations in the short grass lying next to a flock of geese. The illusion goes away immediately. 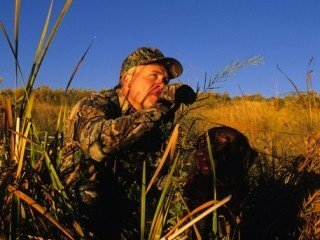 Even on a field holding hundreds of birds, you’ll be lucky to fool even one or two flocks without careful planning. Field variations are the key to success. In some areas you can get away with hunting the edges of the grass field, and if you can you’re almost home free. Back the blinds into the weeds at the field’ edge and cover the blinds completely with native vegetation using the camouflage loops on the blind to hold the veggies in place. In many situations geese have learned how to avoid ANY cover that looks big enough to hide even layout blinds. In this case it’s tough! Look for any variation in the field and use them to your advantage. Even very sparse vegetation found along fence rows helps. Put the blinds near the tallest grasses and gather grasses from further down the fence row to hide the blinds. Several blinds well grassed up lying near each other can seem to form a natural looking fence row edge. Serious goose men in these situations may spend as much as an hour before daylight hiding their blinds. The results of hiding in the middle of nowhere, properly camouflaged, are piles of geese. Well educated geese regularly land in the quality full body decoys of completely hidden hunters. Birds landing within feet of the blinds is commonplace. Don’t skimp on the decoys, anything will work as long as it looks exactly like a goose. Take the time and use all available cover to fool birds in the short grass.